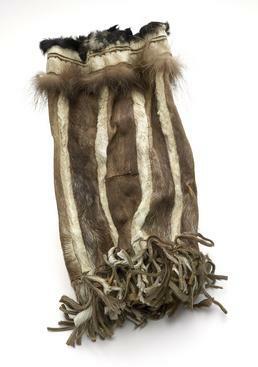 A small bag made of summer caribou skin, used to carry gunpowder, rifle cartridges, or other hunting supplies. It dates to the 1870s, when firearms had only recently become available to residents of Norton Sound. Anna Etageak: Niut. Upanġaami saatuuraupkaqłui niut. Anna Etageak: Must be caribou [skin]. Art Ivanoff: What kind of feathers [at top] I wonder? Anna Etageak: Tiŋmiaq. Tiŋmiam mitkugigai. Oscar Koutchak: They’re too soft for fur. Anna Etageak: They even used to make parkas from them. Pluck the big feathers off it. Soften the skin. They’re warm. Theresa Nanouk: “Hunting bag,” it says [museum label]. Frances Charles: That’s got to be a shell [ammunition] bag. Oscar Koutchak: Hunting bag, yes. Theresa Nanouk: Hunting bag-kauruq guuq naagaa una natmautiŋuluutauua. [Shell bag (from stem qaġruk “harpoon head, spear point, arrowhead, ammunition shell, bullet”)]. Theresa Nanouk: Aktuuvałaktuq kaa qaġrukuviugumi. Oscar Koutchak: Uvva kiaq qaa in those days qaġruqaqpat. Theresa Nanouk: Natmauġauraq [small hunting packsack] maybe? Oscar Koutchak: Natmauġauraq, yes. That’s a long time ago. I wonder how the world was a long time ago, must be pretty tough. 1. According to Frances Charles, niut [leggings] is hide from caribou or reindeer legs, usually taken in the summer when the fur is thin.